Hello everyone, welcome! Today I am going to be talking about childhood nostalgia, and a recent acquisition in the form of Flash Point Fire Rescue. When I was a kid I wanted to be a fireman. I think that is not uncommon as I liked the idea of daring rescues and being a hero and so on. However, a number of factors including laziness, cowardice and disability prevented such a career choice so I resigned myself to a life of relative safety and a career absent running into burning buildings. But it was the first job I ever wanted and as such it sort of sticks in your mind. So, when I got the opportunity to play Flash Point a few years back, I was very eager. And when it returned to Kickstarter with a new expansion, I was all over it. 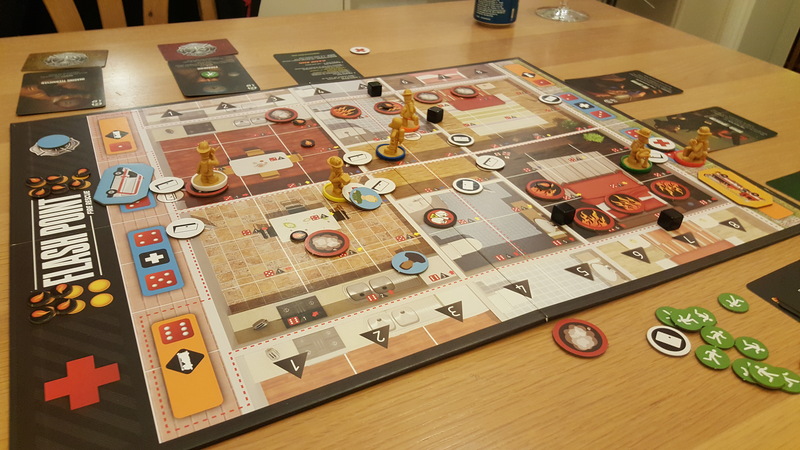 Flash Point is a cooperative game where players take the roles of firefighters. A map is set up which can be anything from a bungalow to a hotel with multiple levels to even a ship in port, where a fire has broken out. Players take it in turns to move their firefighters, fight fires and search for survivors. The aim of the game is to get a certain number of survivors out before the building collapses or they are all killed by fire. I have to say that after receiving this from Kickstarter, Flash Point rapidly became my most played game because it is easy to learn, relatively quick to play and actually is quite intense. Let me outline the reasons why it became a favourite. For beginner players it is recommended that all firefighters are treated the same…but since I had played before and I consider my friends to be skilled enough to handle the full rules, we played with the full rules. Which includes different types of firefighter. This can be important. There are some firefighters that are great at knocking down fires, for instance CAFs Firefighter, the Veteran and the Generalist working together will knock down a lot of fire in a short space of time. The Paramedic and the Rescue Specialist, on the other hand, are rubbish at fighting fire but are much better at getting people out. Neither the Structural Engineer nor the Rescue Dog can fight fire but have their own strengths (though I have to admit, without houseruling the Rescue Dog, it really is not a good choice as it is too limited). Basically, each character gets (on average) 4 actions. A move is an action, fighting fire is an action, chopping a wall is 2 actions, carrying something doubles your move, and operating the vehicles (Fire Truck and Ambulance) take numerous action. When I play, my character of choice is the Paramedic. She is rubbish at fighting fires but can spend an action to treat a wounded survivor that can then be more easily escorted out. In essence, I like playing as search and rescue, rather than fire attack. However, I generally don’t mind who I play (but not the Dog) as each one can be fun. One game I played as the structural engineer. I couldn’t fight fire, but I was able to go into the building and shore up broken walls and disable hotspots (things that cause the fire to flare up). When I couldn’t do that, I ran outside and either jumped in the fire truck or directed the ambulance. You can have fun playing as virtually any character…and unless you have added one of the optional rules in, you can change midgame by swapping gear at the firetruck. This may seem like a moot distinction, however it adds to the tension in the game. With a strong force attacking the fire, it is possible to knock it down and keep it more or less under control. The Veteran and Generalist can clear a room pretty quickly working together, whilst the Driver in the firetruck can actually get an entire quadrant of the building under control. And then you get to the stage in the movie where Fire Fighters are advancing through rooms, smoke everywhere and unbearable heat looking for survivors – worried that fire could and will pop up again. The game mimics this. You can extinguish every single source of fire, but until you rescue the civilians it will always comeback, and it doesn’t take much to flare out of control. And if fire pops up and spreads onto a civilian, which can happen even when you thought it was safe, that civilian is dead and you are one step closer to losing. Believe me when I say the discussions between players get quite intense as we try and figure out how best to keep the fire down, and rescue the civilians. The game comes with a couple of boards which means you don’t have to play the same map over and over, however, there are many expansions with more boards which adds to the variety. You also add into the mix multiple levels to contend with, more explosive stuff, fire doors that jam and chemical spills. (Hazardous Materials are a part of any game, but there is a Laboratory Map which can generate spills or something like that – we haven’t played that one yet). More than that there are optional rules supplied to add to the challenge. For instance deal roles out randomly, and don’t permit changes. Or if a Fire Fighter gets knocked by fire, don’t send to the ambulance. They stay on the board needing medical attention (I really like that one). There were loads and the Game Designers specifically state in the rules, change what you like to make it work. I am a big fan of COOP games and I have to say this one is probably my favourite by a long way. It is simple, the concept is one you can really get behind, and it is intense – it isn’t easy and even a building under control can flare up pretty quickly if you turn your back. Highly recommended. I have seen this game but have yet to play it. I get easily stressed by co-op games though, but this is one of the more interesting one’s I have seen. Flashpoint is fantastic. Out of curiosity, what is it that stresses you in particular? I tend to find coop games more fun as you are playing with friends, rather than against them and I was surprised by your comment. Coop for me I find more difficult as it is playing against the game. Versus playing against friends is less stressful for me. Maybe because they are more predictable I’m not sure. I find that play against the game tends to be more intense in how quickly things can go wrong, whereas play against other people your opponents can moderate how vicious they are. As an example, when I am the consul in Super Dungeon Explore I know exactly how to win the game by picking on players but choose to split damage between players so they have more of a chance. It makes it more fun for them and so long as I get to use my special abilities I don’t mind a longer game, even one that I lose. Maybe that is it?